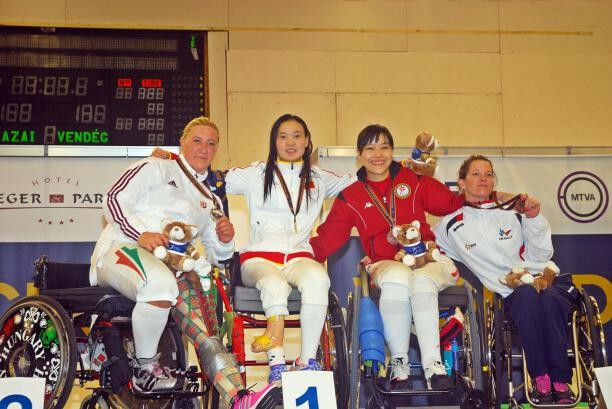 China’s Xu Feng Zou continued her superb form at the International Wheelchair and Amputee Sports Federation (IWAS) Wheelchair Fencing World Championships by adding a second gold medal to her collection. After her surprise success in the epee competition on the opening day of action, Zou has now added the category A sabre title thanks to a 15-11 win over compatriot and defending world champion Jing Bian. Zou was ranked number 17 in the world before the Championships in Eger, Hungary, but took the attack to Bian and was a worthy winner. There was another win for China in the men's competition as Jianquan Tian beat countryman Yijun Chen 15-10 in a final which was a repeat of the 2013 World Championships. Ukraine’s world number one Andrii Demchuk had to settle for bronze with France’s Ludovic Lemoine. The final in the men’s sabre category B was an all-Polish affair with Adrian Castro facing Grzegorz Pluta. In the end it was the former who claimed a 15-13 win with Anton Datsko of Ukraine and China's Yan Ke Feng collecting the bronzes. Ukraine did get a gold medal as Tetiana Pozdniak won the category B sabre by beating Georgian Irma Khetsuriani 15-13 while in the men's epee category C, Russia’s Alexander Logutenko defeated Italian rival William Russo to defend his world title. Germany’s Ulrike Lotz-Lanke won through in a small field to take the women’s epee category C title.